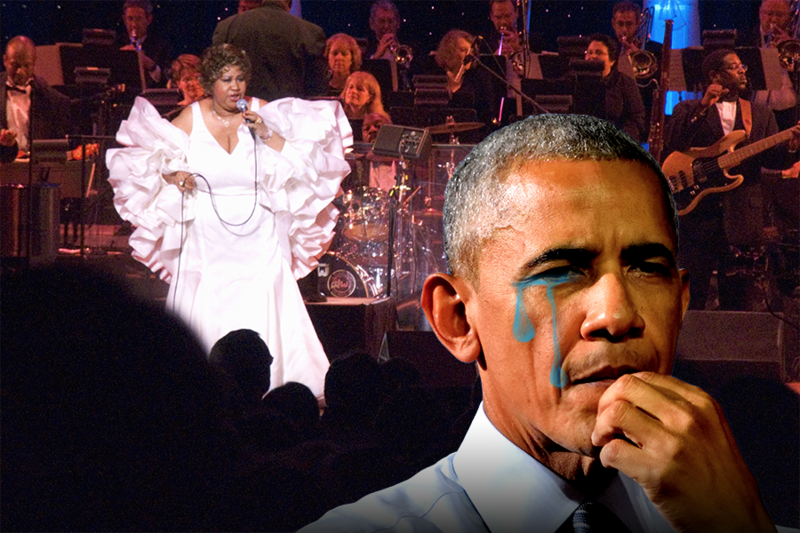 What was it about the Queen of Soul that made Obama—and so many other guys—break down in tears? Bidding farewell to the Queen of Soul, Aretha Franklin, who has passed away at 76, is a deeply emotional prospect. Almost as emotional as her singing — and the awed response it drew from anyone who was blessed to hear it over the past 60 years. As news anchors weep at the news, recall how easy it was to weep at her godly voice. Aretha is making me cry. That was a brilliant prayer. Listening to Aretha and kinda tearing up right now. What was this power? How did she break down everyone from a steely president to regular guys who still half-believe that crying exposes a weakness? The prime ingredient, of course, was her brilliant mezzo-soprano tone, something that lovingly caressed your brain and made you feel like a baby again. But she also sang from a place of gospel — her roots were holy — and she never had less than the force of a higher power, which made listening to her work a numinous experience. In her songs were righteous calls to civil and women’s rights, and men, too, could be humbled by that clarity. At times it was as simple as giving us permission to cry by enacting the rituals of heartbreak. No one else could have sung to the magnitude of sorrow at Martin Luther King Jr.’s funeral in 1968, nor with the gratitude owed to Rosa Parks at her memorial in 2005. She had given her gift to their movement, created anthems in their spirit, and gone on to see a measure of the change they’d all promised was gonna come. When Aretha made us cry in her late resurgence as an icon of survival, it was because she imbued her words with the fullness of all that life. And while women can directly empathize with what she experienced (“Chain of Fools” is, to this day, the first and last word on a certain kind of relationship), most men, I think, remain unprepared for Aretha’s brass or her tenderness, and are lost at sea when she makes those disparate elements harmonize. We just don’t have the range. So we imagine, when the tears do come, that she’s somehow gotten the better of us. damn you, Aretha! Men aren't supposed to cry! Trying not to cry at Aretha's AMAZING rendition of "My Country Tis of Thee"
But we know, never mind how we describe it, that this is no defeat. We recognize the joy and liberation in these moments. It is good to be overpowered. To have a strong black 20th-century woman dare us to look at, to live inside her emotions. Men will always be tempted to think of our weeping here as an accident, subject to vague, untouchable influences. In truth, we cry for Aretha as tribute to a world she made tangible and real.